Alan has over 25 years’ experience working with global and national organisations, advising boards and leadership on the global sustainable development issues that will shape their products and business. ArcelorMittal have a large iron mine in Liberia. Alan created and chaired the Ebola Private Sector Group (EPSMG), which at its peak was a collaboration of over 100 companies sharing best practice and coordinating the private response the tragic Ebola pandemic in West Africa. For this he was made a Clinton Global Citizen Honoree in 2015. Previously Alan was a Director at Business in the Community overseeing its Corporate Sustainability programmes. Before that he worked with the Virgin Group for six years. One of his contributions to run the Virgin Earth Challenge (Richard Branson’s $25m prize for scalable, sustainable ways of removing greenhouse gases from the atmosphere). He has also worked at B&Q, Kingfisher and SABMiller) see About Me. In addition he has presented to, or provided advice to over 50 companies ranging from Quorn to the Alberta oil sands industry, see My Corporate Experience. For one happy year in 2013 Alan, though being its Chair, helped establish the Local Nature Partnership for Cornwall and Isles of Scilly but, sadly his ArcelorMittal role pulled him back to London. Alan was a co-founder of the Global Association for Corporate Sustainability Officers which in March 2014 joined forces with the Institute of Environmental Management & Assessment, see My public policy and not for profit work. 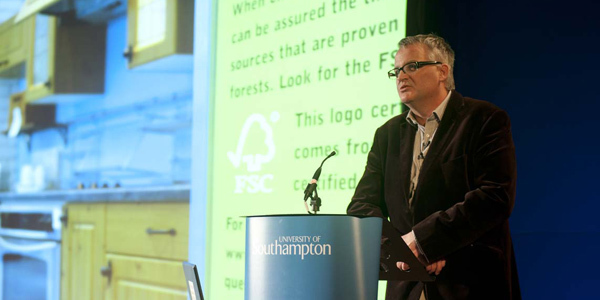 Through his career Alan has developed narratives for how lifestyles will be sustainable by 2050, the idea of choice editing versus consumer choice and has also voiced his opinion on certification proliferation. As well as corporate work he chaired several government think tanks and was a Sustainable Development Commissioner between 2000 and 2009. Aligned to his work for others, Alan has been a – and a popular keynote speaker on the global conference/workshop circuit. See My Speeches. Imagine life without steel, from girders, to railway tracks, fridges and freezers. Modern, sustainable life is impossible without it. With a carbon footprint around 200 million tonnes the challenges for ArcelorMittal, the largest steel company in the world, are obvious. But steel enjoys a recycling rate that exceeds 85%, so the opportunities are also massive. Learn more of what we are doing at the ArcelorMittal website arcelormittal.com. I graduated as a geologist and marine biologist in the late 80s but soon found that counting dead muddy worms was not what I was born to do. So I took a leap of faith and entered the world of retail having guessed (correctly as it turned out) that the eco-thing would one day touch them and that they would need a geological, dead worm counter to help them understand the issues.